Backpackers Chez Patrick hostel has been recommended in many well-known travel guides such as The Lonely Planet, The Rough Guide-France, Le Guide du Routard, GeoGuide, MTV Guide. We are ideally located in the heart of Nice, close to some of the major downtown shopping centres. We are only 5 minutes walk from the central railway station SNCF and maximum 15 minutes walk to the Promenade des Anglais and beaches. There are tram and airport shuttle bus stops close to the Backpackers Chez Patrick. We have dormitory style rooms with 4 and 6 beds per room as well as twin and a 3 bed private room (please note: 3 bed private consist a double bed, bunk bed and for 2/3 people ). Our rooms are comfortable, clean, and safe and a perfect place to relax. Linen and city taxes are included in the room rate and blankets are provided. All rooms have air conditioner. There is no curfew. All guests are provided individual keys to enter the hostel at all times. A refundable key deposit (20 euros) has to be made and the deposit will be refunded upon return of the key before check out. Please note: there is no kitchen, we do not provide breakfast. The hotel is located right in the middle of a shopping street with a choice of cafes and restaurants. 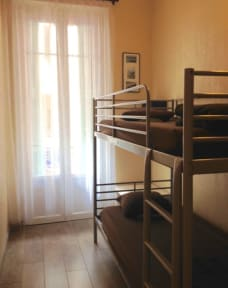 The hostel staff will be happy to help you in any way - from advising on the best places to visit whilst in Nice and the surrounding areas to recommending restaurant, pub or café of your choice. - The Acropolis Congress Centre and many other interesting sites. 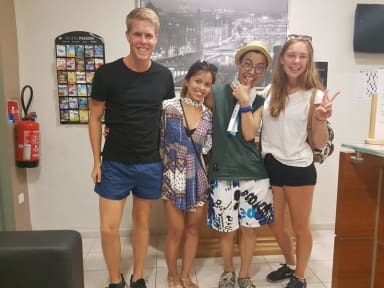 Whilst in Nice at our hostel, you can also visit other Cote d'Azur towns and small villages such as Saint Paul de Vence, Eze, Cannes, Grasse, Antibes, Monaco for just 1,50 euro by bus. ** Please note that any cancellation or change must be notified directly to the hostel at least 48 hours before arrival date, only by e-mail. In case of late cancellation the total of first night of each guest will be charged. ** In order to secure your reservation, we will charge (in advance) your first night to your credit card after the 48 hours cancellation period has ended. The hostel reserves the right to refuse booking if credit card is invalid !